When you think globalisation began depends on how you define it. Ancient civilizations and medieval cities of course exchanged tools, plants, diseases, and ideas. But most recent discussions of the start of globalisation define it as integration of a market across regions or countries, as measured by the convergence of commodity prices. For example, The Economist (2013) argues there was a world silver market after about 1500. O’Rourke and Williamson (2002) argue that commodity price convergence is indeed the best way to measure the integration of markets that defines globalisation. They note the international trade in luxury goods – such as spices, silk, furs, and gold – from 1500 to 1800. But they suggest that falling transport costs led to a globalisation big bang in the 1820s marked by the integration of markets for necessities like grains and textiles. For the first time, this international integration began to affect how capital and labour were used within domestic economies, and thus also began to be the subject of political debates. Studies of market integration focus on prices partly of necessity. We often don’t know the shipping costs or travel times, and how they evolved over time, that would help us track integration with those measures. But prices also have distinct advantages. First, they allow studies to tie in directly to research on the modern law of one price, by using exactly the same statistical methods as are applied to today’s data. Second, reliable statistical inference is possible because there are many observations, even if these were recorded by monks rather than scanners. A wealth of recent research studies the historical departures from the law of one price: how relative prices across locations were related to distance and whether that effect declined over time. And much of this research studies grain prices. For example, Jacks (2005) studies these prices for the period 1800–1913 for up to 100 cities in ten countries. He documents price convergence using several different statistics. Jacks also discusses the causes of convergence and the impediments to it. He considers such factors as transport costs, other transactions costs or improvements such as the rise of bills of exchange, price manuals, marine insurance, the effects of wars, and mercantilist policy (such as the 17th century Navigation Acts in Britain). He finds a significant decline in the effect of distance over time. Some studies also focus on intranational price convergence. That can serve as a benchmark by which to judge the degree of international integration. But intranational convergence also may have been a historical precursor to international convergence. Organised data on prices exist for many countries in part because of the work of the International Scientific Committee on Price History in the 1930s and 1940s, described by Cole and Crandall (1964). These sources include the monographs by Posthumus (1946) on Holland and the famous study by Hamilton (1947) on Spain. Nowadays, data from such studies can be found at the Global Price and Income History Group , the IISH List of Datafiles of Historical Prices and Wages , Corn Returns Online , eh.net , or the Center for International Price Research . Over the last decade, research by economic historians has provided evidence of early globalisation, pre-dating the technical advances of the 19th century. 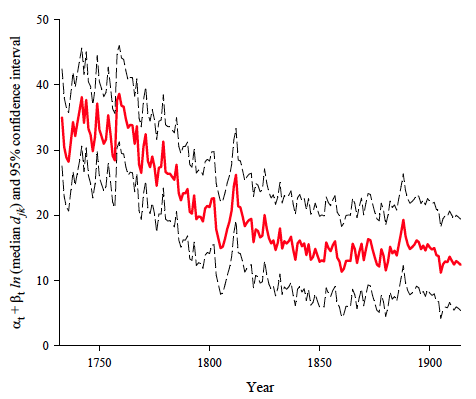 Jacks (2004) provides evidence that grain price dispersion across cities in northern Europe began falling as early as the 1500s. Shiu and Keller (2007) show integration of rice markets in the Yangzi Delta in the 18th century and a similar pattern in grain markets in Britain. Dobado-González et al. (2015) confirm intranational integration of rice markets within parts of China and Japan in the 18th century (as in Europe), though not international integration in the Far East. Dobado-González et al. (2012) also use commodity price convergence as the metric for measuring globalisation. They show statistically that grain markets were becoming integrated in the 18th century, within Europe and between Europe and the US. This process was not uniform or monotonic, and was interrupted by the Napoleonic Wars. But they argue that, especially for the grain trade, new trade flows, a fall in tariffs, a decline in piracy, and improved access to the sea more than offset the disruptive effects of warfare and mercantilism. Kaukiainen (2001) provides some concrete examples of the mechanisms at work. He studies the inter-city times for the transmission of Lloyds’s List (a shipping newsletter) and the private correspondence of a Finnish merchant. These data show that steamships, improved mail-coach times, and faster packet ships led to declines in mail dispatch times that helped integrate markets even if goods shipped no faster. Notably, these improvements occurred early in the 19th century, before the telegraph and the railway. Our own research studies price convergence using annual market prices from within Sweden, for 1732–1914, painstakingly collected by Jörberg (1972) and his colleagues (Crucini and Smith 2016). The prices are for 32 towns and 19 commodities: nine agricultural goods (beef, butter, hay, hops, pork, straw, tallow, wheat and wool), two animals (oxen and sheep), one fish (Baltic herring), four building materials (bar iron, log timber, sawn batten, and tar) and three sources of light or heat (charcoal, tallow candles, and wax candles). This large coverage of years, towns, and commodities yields 502,689 relative prices. Sweden changed currencies several times during the 18th century, and the krona was not introduced until 1803. Thus we cannot graph continuous price series because it is not clear how to splice across currencies. But we can readily calculate a measure of price dispersion: the absolute value of the log, bilateral, relative price. We then relate this measure statistically to (a) the great circle distance between towns, and (b) the year. Imagining the distance on the horizontal axis and price dispersion on the vertical axis, we then estimate the median distance function, which is simply the intercept plus the slope drawn through this scatterplot and evaluated at the median distance. The large number of prices means that this function can be estimated separately for each year pooled across commodities. We do not need to guess the shape of the time trend. Figure 1 shows the result. The central, red line gives the median distance function and the outer, black lines give its 95% confidence interval. This overall time effect is volatile at the beginning of the sample, but then begins a marked decline after 1760. It falls fastest in the remainder of the 18th century, then continues a more gradual decline – with some volatility – until 1914. A similar pattern appears for almost all individual commodities. Thus the distance function became flatter over time. The early 19th century saw the introduction of canals in Sweden, including the Trollhätte canal in 1800 and the Göta canal in 1832. Railways and the telegraph followed during the 1850s and 1860s. And even a trip from Stockholm to Gothenburg could take up to a week before the railway. Why then did price convergence begin during the 18th century? Unfortunately, we cannot yet answer this question by pointing to specific improvements in roads, ships, or mail service. Even if we do not know the transport and communication changes that were at work in 18th century Sweden, we do know from the other research cited here that a falling distance effect in relative prices historically has been an accurate indicator of such improvements. This is a key lesson from the historical research. Why does this matter? Even today, prices are relatively less expensive to collect than many other data. Atkin and Donaldson (2015) find that internal transportation costs (and hence distance effects) on prices in Ethiopia and Nigeria can have a large effect on prices at the port of exit and hence on international trade. Just as in the historical data, intranational price convergence may be a precursor to globalisation. Atkin D. and D. Donaldson (2015) “Who’s getting globalized? The size and implications of intranational trade costs”, NBER Working Paper 21439. Cole, A. and R. Crandall (1964), “The international scientific committee on price history”, Journal of Economic History 24, 381–388. Crucini, M.J. and G.W. Smith (2016), “Distance and time effects in Swedish commodity prices, 1732–1914”, NBER working paper 22175. Dobado-González, R., A. García-Hiernaux, and D. E. Guerrero (2012), “The integration of grain markets in the eighteenth century: Early rise of globalization in the West”, Journal of Economic History 72, 671–707. Dobado-González, R., A. García-Hiernaux, and D. E. Guerrero (2015), “West versus Far East: early globalization and the great divergence”, Cliometrica 9, 235–264. Hamilton, E.J. (1947), War and Prices in Spain, 1651–1800. Cambridge: Harvard University Press. Jacks, D.S. (2004) “Market integration in the North and Baltic Seas, 1500–1800”, Journal of European Economic History 33, 285-329. Jacks, D.S. (2005) “Intra- and international commodity market integration in the Atlantic economy, 1800-1913”, Explorations in Economic History 42, 381–413. Jörberg, L. (1972), A History of Prices in Sweden 1732–1914. Volume I: Sources, Methods, Tables. Lund: CWK Gleerup. Kaukiainen, Y. (2001) “Shrinking the world: Improvements in the speed of information transmission, c. 1820-1870”, European Review of Economic History 5, 1–28. O’Rourke, K. H., and J.G. Williamson (2002), “When did globalisation begin?” European Review of Economic History 6(1), 23–50. Posthumus, N.W. (1946), Inquiry into the History of Prices in Holland. Leiden: E. J. Brill. Shiue C.H. and W. Keller (2007) “Markets in China on the eve of the industrial revolution”, American Economic Review 97, 1189–1216. The Economist (2013) “When did globalization start?” 23 September.